Quiet-touch Keys. Quiet, responsive, thin-profile keys.Calculator Hot Key. With the touch of the button, you can quickly access the Calculator.Spill-Resistant Design. No software needed. Just connect the keyboard to your PC and go!Comfort for Either Hand. Title: WIRED DESKTOP 600. Condition: New. Missing Information?. Catalogue Number: APB-00006. The keyboard and mouse both use USB wired connections to your PC, giving flawless responsiveness, no radio interference and no batteries to replace! And there are no batteries to replace! Keyboard model number Wired Keyboard 600. · Realize the backlight of three colors (yellow, red, green) with the LED keys, and press the FN key and the LED key to change the brightness of the backlight. It can be pressed easily. It is easier to clean the key cap. We look forward to working with you! Model : KB-0168. 100% Authentic! All packages are shipped directly from Japan!. Wired Dsktp600 ForBsnss USB Port FrenchCanadian Canada Hdwr Canada Only For Bsns. Asia and New Zealand. Middle East. Wired Dsktp600 ForBsnss USB Port English Canada Hdwr Canada Only For Bsnss. Microsoft optical mouse P58-00057. Benefit from great features such as the for both right-and left-handed suitable design, and let nothing stand in the way of your creativity. Connection: wired. Colour: black. Microsoft BZ5-00002 Optical Desktop with Fingerprint Reader !!! The Microsoft BZ5-00002 Optical Desktop is a combination of a high-performance advanced keyboard and an optical mouse. You can log on to the system conveniently with the touch of a finger! Five customizable keys that allow one-touch access to your favorite web pages. English / Hebrew Keyboard layout. This wired keyboard provides a great value in a sleek desktop. Appreciate a keyboard with quiet, responsive, thin-profile keys. Enjoy a beverage while you work. This keyboard is designed to withstand an accidental spill. Model RT9480. Microsoft Basic Keyboard 1.0A. Standard 104 key layout, with built-in function keys. (See photos). Manufacturer: Microsoft. Color: Black, (Mouse: Black). The exterior box may have been opened for inspection or photos. Microsoft Optical Technology: Wheel Mouse Optical replaces moving parts with an optical sensor that scans the surface beneath. the mouse. Wheel Mouse Optical works on a wide array of surfaces, eliminating the need for a mouse pad. 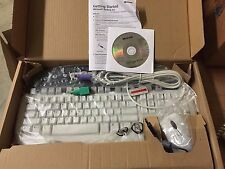 Product Title Microsoft Wired Desktop 600 Keyboard and Mouse (APB00001). Quiet Touch Keys - Quiet, responsive, thin-profile keys. Calculator Hot Key - For one-touch access to the calculator. Spill-Resistant Design - Integrated water channels drain liquid away. · Color Variation: None / Color: Black. One (1) keyboard and one (1) mouse as pictured and described. tested, working 180912-005 WH. We all rally together under the battle call, "Hey! That's not junk!". Bringing about that shift. Drop us a line and we will assist if we can. We'd like to settle any problem in a friendly manner. We want to make sure you are happy with our item. OPEN BOX ITEM. CE QUI EST INDIQUÉ EST CE QUE VOUS RECEVREZ. LO QUE SE MUESTRA ES LO QUE RECIBIRÁ. Downloadable software products, warranties and software where unique codes have been used. Gift cards. If your item is faulty, you can choose from the following options Depending on availability and your location. Are GENUINE Microsoft ! (See Photos). Manufacturer: Microsoft. Wired, optical Mouse. box may have been opened for inspection or photos. If needed, the exterior box will have been repaired/reinforced. Product Type: Keyboard & Mouse. Great value in a sleek desktop. Country of Origin: China. Device Supported: Computer. Pointing Device Weight (Approximate): 3.27 oz. Keyboard/Keypad Weight (Approximate): 1.26 lb. I’ll be happy to respond and help you. New Open Box Never Used. Product Line: Wired Desktop. Keyboard/Keypad Host Interface: USB. Pointing Device Host Interface: USB. Manufacturer: Microsoft Corporation. Pointing Device Type: Mouse. Product Model: 600. Product Type: Keyboard & Mouse. Wired Desktop 600 USB English NA Hardware with Black finish...This desktop set combines a spill-resistant keyboard and optical mouse to deliver all the features you need--and more--with Microsoft quality and reliability. Enjoy plug-and-play setup, Microsoft Xbox 360 compatibility, Quiet Touch keys with quick access to media controls and calculator, and a comfortable ambidextrous mouse. Product Title Microsoft Wired Desktop 600 (3J200001). Product Line Wired Desktop. Manufacturer Microsoft Corporation. Keyboard/Keypad Host Interface USB. Pointing Device Host Interface USB. Product Model 600. Wired Desktop 600 USB English NA Hardware with Black finish...This desktop set combines a spill resistant keyboard and optical mouse to deliver all the features you need and more with Microsoft quality and reliability. Enjoy plug and play setup Microsoft Xbox 360 compatibility Quiet Touch keys with quick access to media controls and calculator and a comfortable ambidextrous mouse. Wired Dsktp 600 USB Port BLK. Manufacturer: Microsoft. UPC Number: 882224741958. Product Line: Wired Desktop. Product Type: Keyboard & Mouse. Manufacturer: Microsoft Corporation. Keyboard/Keypad Type: Keyboard. Product Model: 600. Pointing Device Type: Mouse. Keyboard/Keypad Host Interface: USB. Wired Desktop 600 Keyboard and Mouse & Dsktp USB Port BLK. Product Line: Wired Desktop. Product Family: Wired Desktop. Product Type: Keyboard Mouse. Manufacturer: Microsoft. Keyboard/Keypad Host Interface: USB. Wired Dsktp 600 USB for Bus. Manufacturer: Microsoft. UPC Number: 889842106770. Up for Sale is this USED MICROSOFTDesktop Wired USB Keyboard Model 400 (No Mouse) Good working condition.